To generate a new CA-Signed SSL-Certificate for use with the IBM HTTP Server you need to start the iKeyman-Utility first. The iKeyman is the Key Management Tool from IBM. 4. After the Key-Database is loaded switch to "Personal Certificate Requests" (under "Key database content"). 6. Click "OK" to save the certificate request in a file. 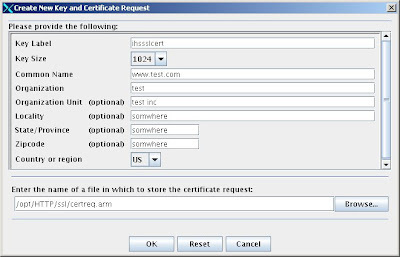 7. now you need to provide the content of the certificate request file to your Ceritifcate Authority (e.g. : VeriSign). You will receiving a new certificate file from them. 8. If you received the certificate switch back to "Personal Certificates" (under "Key database content"). 9. Click Receive and navigate to the certificate file. Click Ok to import the certificate file. I've only really come across the Apache and Exchange servers so I'm not really familiar with how to Create SSL Certificate on the IBM server, so this is a really top resource for webmasters alike. We just bought a wildcard ssl certificate at ClickSSL. As a first time customer of ClickSSL we are very happy with the service and support.